I have known Ian for a number of years, through professional association in the auto industry and sailing at GFS. My relationship with Ian has taken many forms, forms regularly overlapping, as a friend, employer, customer. supplier, adversary and like soul. Ian is one of those guys that packs more into a day than most of us can achieve in a week. Ausreo (Caliban II) is a Beneteau first 47.7 that Ian has been put to its primary purpose with some vigour. Ausreo at the start of a Sydney Hobart the crew on the rail wearing construction gear in honor of their sponsor. 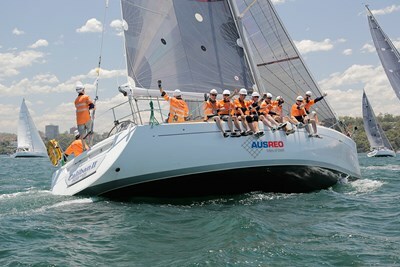 Ausreo is a regular competitor in Off Shore racing including its annual pilgrimage from Sydney to Hobart, in company with others, a pilgrimage that starts each year on Boxing day. A few years ago I was part of the crew that sailed Ausreo back from Hobart, it was after a particularly gruelling race that took bit of a toll on a number of boats, fortunately not on any of the sailors. It was a trip where I learned a bit more about on the run repair work, Fortunately there is a little town with a pretty good harbour about two thirds of the way into the journey, called Eden that not only has a reasonable engineering shop that could make up a part for the auto pilot,but also decent amenities for the crew. Ausreo has recently gone through a major restoration, returning her to a condition closer to when she was younger girl, in her subsequent races she has proven to be very competitive under the measurement handicap systems (IRC and ORCi) no mean feat for her, the crew and Ian.